B Real of Cypress Hill's daily variety show. On this episode of The Smokebox, B Real is joined by cannabis chef / connoisseur Edible Dee & discuss edibles, dosing + more. On this episode of The Smokebox, judges Vanessa Lavorato & Miguel Trinidad talk about the new season of Bong Appetite : Cook-Off featuring B-Real as the Host. Straight from the heart of the Emerald Triangle, cultivators & musicians Mendo Dope join B Real in The Smokebox & talk cannabis, music + more. In this episode of The Smokebox, personal trainer Creeper from Cholofit discusses motivation for starting to workout, his diet which includes energy tamales + more. Known for his iconic roles as a hispanic gangster, actor & producer Noel Gugliemi talks about the start of his acting career, working with actors such as Denzel Washington, Mel Gibson + more. Former NBA star Matt Barnes joins B Real in The Smokebox & discuss using cannabis during NBA career, becoming an advocate for the plant, cannabis ventures + more. The Smokebox with Iron Mike Tyson discusses getting hypnotized before fights to keep him calm, how Eden Britton met with the legendary boxer & opening up a cannabis lounge on Sunset Blvd. on the corner of La Cienega. Comedian Donnell Rawlings steps into the Smokebox with B Real & talks The Chappelle Show, friendship with Dave + more. On the latest episode of The Smokebox B Real is joined by LA recording artist Mr. Capone-E to talk about about his latest projects, cannabis, + more. On this episode of The Dr.Greenthumb Show Podcast we welcome Mr Criminal on the show for the second time in the Smokebox. On this episode of The Dr.Greenthumb Show Podcast we welcome Actor/Comedian Aries Spears on the show for the second time, Enjoy this hilarious episode. on this episode of the Dr Greenthumb Show we discuss our Top 10 weed songs of all time., Enjoy! One of the best producers in HipHop and long time friend of ours Alchemist joins us on the Dr Greenthumb Show for a very smokey Smokebox. The Dr.Greenthumb Show Podcast Ep.64 w O.C. The legendary D.I.T.C. crew member OC joins us on the Dr Greenthumb Show. On this episode of The Dr. Greenthumb Show we are joined by the beast Atlanta rapper Kap G to talk about new music, fashion, movies and weed..
on this episode of The Dr. Greenthumb Show we are joined by the beast Vinnie Paz to talk about his new album "The Pain Collector" out now everywhere. On this episode of the Dr Greenthumb Show the extremely talented BREVI joins us to discuss the new Cypress Hill album witch had her featured on 4 songs, Enjoy! The Legendary Freestyle Mc Supernatural joins us on this episode of the Dr Greenthumb Show as we discuss The Culture , Cannabis & he Freestyles inside the Smokebox. 16 year NBA veteran Al Harrington steps in the Smokebox with B Real to discuss basketball, The BIG 3, benefits of cannabis + more. We are back with another episode of The Dr.Greenthumb Show with G-Unit member Young BUck to talk about his new album as he joins B-Real in the Smokebox! We are back with another episode of The Dr.Greenthumb Show with Demrick to talk about his new album "Came A long Way' out now on all platforms. We are back with another episode of The Dr.Greenthumb Show this time legendary rapper/actor Fredro Starr of ONYX joins B-Real in the Smokebox! We are back with another Smokebox this time with the Harlem legend Dame Dash on this episode of The Dr Greenthumb Show Enjoy! Dr Greenthumb is back with another Smokebox this time with his long time friend & legend Dj Tony Touch on this episode of The Dr Greenthumb Show Enjoy! We welcome the Mixtape Queen her self Dj Lazy K on this episode of The Dr Greenthumb Show Enjoy! We welcome the dynamic duo Jericho Jackson (Elzhi & Khrysis) Legendary Crooklyn Dodger himself Masta Ace on this episode, Enjoy! The Dr. welcomes his long time friend into The Smokebox live on show to discuss the current state of hiphop, new businesses & new music with Craig Mack. We are back with Brooklyn MC Radamiz as we discuss upcoming shows, classic hiphop & the type of weed he likes to smoke on this edition of The Dr. Greenthumb Show. Making his 4th appearance in The Smokebox, Berner lights up some flavors with B Real & talks about his latest album 'The Big Pescado' produced by Scott Storch, what he has in store for his dispensary 'Cookies' that opened in Maywood, CA back in January + more. On this episode of the Dr. Greenthumb Show B-Real welcomes Beija Velez to talk Fashion, working with Usher & her new project with Adidas, Enjoy! On this episode of the Dr. Greenthumb Show B-Real welcomes newly signed Roc Nation artist Q Da Fool on the show to talk about growing up in Maryland, being locked up & influences as a youth., Enjoy! On this episode of the Dr. Greenthumb Show B-Real welcomes his long time friends and legends Mr. Cartoon & Estevan Oriol as they talk about the early Soul Assasin days, latest projects & 25 plus years of friendship on this episode! On this episode of the Dr.Greenthumb Show B-REAL welcomes two of our family members in the smokebox Dizzy Wright & Demrick to talk about the Still Movin movement & more..
On this episode of the Dr.Greenthumb Show B-REAL welcomes one of Hip Hop's finest MC's EVIDENCE of Dilated Peoples in the Smokebox for the second time to talk about his new album "Weather or Not" enjoy! On this episode of the Dr.Greenthumb Show B-REAL welcomes legendary rap group from France IAM as they talk about Influences, staying off social media, 30 years in the game & more! On this episode of the Dr.Greenthumb Show B-REAL welcomes producer/rapper Childish Major all the way from the ATL to talk about his new album, transitioning from producer to rapper & more. On this episode of the Dr.Greenthumb Show B-REAL welcomes Rapper/Reggaeton artist Chyno Nyno to talk about the new projects, upcoming show & more, Enjoy! On this episode of the Dr.Greenthumb Show B-REAL welcomes the legendary icon Snoop Dogg on the show as he talks about weed, his new album & more, enjoy! On this episode of the Dr.Greenthumb Show B-REAL welcomes Radio Host & Author Rude Jude, enjoy! On this episode of the Dr.Greenthumb Show B-REAL welcomes Buffalo MC Benny The Butcher on the show, enjoy! On this episode of the Dr.Greenthumb Show B-REAL welcomes Kid DJ sensations Dj Livia & Dj Precious on the show, enjoy! On this episode of the Dr.Greenthumb Show B-REAL welcomes ItsTheReal on the show, enjoy! On this episode of the Dr.Greenthumb Show B-REAL welcomes Producer/MC Black Milk from Detroit on the show, enjoy! On this episode of the Dr.Greenthumb Show B-REAL welcomes Rapper Hopsin on the show, enjoy! On this episode of the Dr.Greenthumb Show B-REAL welcomes Hip-hop legend Tech N9ne on the show, enjoy! On this episode of the Dr.Greenthumb Show B-REAL his Cypress Hill brother & band mate the legendary Eric BoBo on the show, Enjoy! On this episode of the Dr.Greenthumb Show B-REAL welcomes Bay Area rapper Philthy Rich on the show, Enjoy! On this episode of the Dr.Greenthumb Show B-REAL welcomes legendary Hustler from South Central Los Angeles "Freeway" Rick Ross on the show, enjoy! On this episode of the Dr.Greenthumb Show B-REAL welcomes legendary MC Craig G on the show, enjoy! On this episode of the Dr.Greenthumb Show B-REAL welcomes rapper Zoey Dollaz on the show, enjoy! On this episode of the Dr.Greenthumb Show B-REAL welcomes rapper Jin Gates on the show, enjoy! On this episode of the Dr.Greenthumb Show B-REAL welcomes Los Angeles female MC Reverie on the show enjoy! On this episode of the Dr.Greenthumb Show B-REAL welcomes South Central Los Angeles rapper Thirsty P on the show, enjoy! On this episode of the Dr.Greenthumb Show B-REAL welcomes Sick Jacken of Psycho Realm as they discuss the 20 year anniversary of the first record & more..
On this episode of the Dr.Greenthumb Show B-REAL welcomes legendary West Coast MC Money B of Digital Underground. On this episode of the Dr.Greenthumb Show B-REAL welcomes MC & Producer duo Young Futura on the Show. On this episode of the Dr.Greenthumb Show B-REAL welcomes Filmmaker/Buisness owner Andrew Ahn of Boos Philly. On this episode of the Dr.Greenthumb Show B-REAL welcomes legendary Los Angeles rapper 2Mex to talk about his new project "Lospital"
On this episode of the Dr.Greenthumb Show B-REAL welcomes singer/producer Iman Omari. On this episode of the Dr.Greenthumb Show B-REAL welcomes los Angeles based rapper Hawdwerk on the show & B-Real does a Dj Set. On this episode of the Dr.Greenthumb Show B-REAL welcomes DJ Couz from Japan on the show. On this episode of the Dr.Greenthumb Show B-REAL blesses the turtables w a Dj Set. On this episode of the Dr.Greenthumb Show B-REAL welcomes Dj Steve1der from Los Angeles on the show. On this episode of the Dr.Greenthumb Show B-REAL welcomes Dj Mona Lisa from Los Angeles on the show. On this episode of the Dr.Greenthumb Show B-REAL welcomes Queensbridge legend Prodigy of Mobb Deep on the show. On this episode of the Dr.Greenthumb Show B-REAL welcomes Portland Freestyle Phenom Harry Mack. On this episode of the Dr.Greenthumb Show B-REAL welcomes Lazie Bone of the legendary Bone Thugs n Harmony. On this episode of the Dr.Greenthumb Show B-REAL welcomes legendary Queens legend Large Professor to talk about Hip Hop, Djn, Illmatic & more..
On this episode of the Dr.Greenthumb Show B-REAL welcomes legendary MC Chino XL & Singer Rama Duke to take hiphop, rock & the new single "Under The Bridge". On this episode of the Dr.Greenthumb Show B-REAL welcomes legendary chicago mc Twista & Dj House Shoes of Detroit. 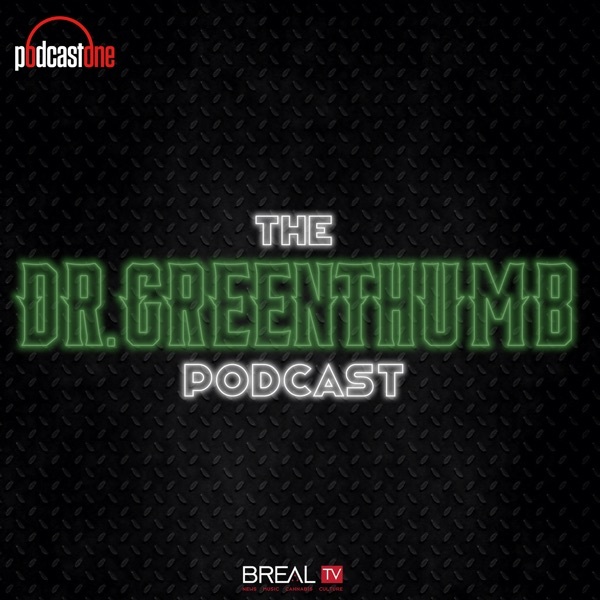 On this episode of The Dr.Greenthumb Show B-REAL welcomes The Beatnuts & Termanology, Enjoy! On this episode of The Dr.Greenthumb Show B-REAL and the crew sit down w MC/Producer from Detroit Nolan the Ninja & the musical elections of DJ LORD of Public Enemy. Did you come for the Doctor? Looking for the OG? Have you ever had the problem of running out of weed and just can’t find some anywhere? Maybe you’re searching for the best weed that you had in your life – or do you just want to get baked like Betty Crocker? If you answered “yes” to any of these questions, you’re in the right place because the Dr. Greenthumb show is just the prescription you need for all things reefer-related. Established in 2009, Dr. Greenthumb is a live stream interactive talk show that features regular appearances from special guests and covers a variety of topics including music, sports, current news and, of course, everything relevant in the world of weed. Along with a cast of colorful co-hosts, the program is led by none other than Dr. Greenthumb himself, B-Real; and when the Stoner of the Year and front man of Cypress Hill is running the show, you already know you’re hearing from an undisputed authority on music and marijuana. Formerly known as “The 420 Show,” and with a history dating back to the days of Stickam, the Dr. Greenthumb show is a pioneer among the many pot productions that now exist; and they’ve been providing audiences with an eclectic mix of quality content for the past seven years. For one of the best sources of stoner entertainment and news, look no further; come one, come all and see how it’s done every week day at 4:00pm PST on BREAL.TV. Dr. Greenthumb’s got it all… and when you get your prescription here, you don’t ever need a second opinion.